Brewery visitors joined Brentwood Town Twinning Association supporters to enjoy a little taste of German Oktoberfest in July. Held to celebrate the town’s links with Landkreis Roth in Germany, July Fest, complete with Oom-Pah music, took place at Brentwood Brewery on Saturday (28th). Once again the brewery was delighted to welcome the Mayor of Brentwood Cllr Sheila Murphy. Talking about the benefits to Brentwood of town twinning, she said: “It’s something traditionally we’ve always done very, very well and as people get older we need to bring the younger people in to join us and continue it. Along with the dozen cask and draught Brentwood and Elephant School beers on offer there were five different bottled beers on the bar from the Pyraser Landbrauerei in Thalmässing, Bavaria which is in the Landkreis Roth area. To organise July Fest, Brentwood Brewery worked in partnership with Brentwood/Landkreis Roth Town Twinning Association. Last year, a new friendship was struck up between Brentwood Brewery and Pyraser Landbrauerei. 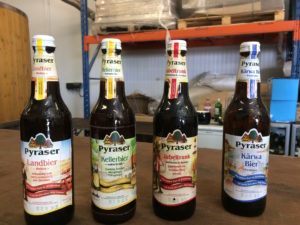 Roland Kannor, MD Brentwood Brewing Company: “Thanks to Brentwood’s German twin town links, we’ve made friends with the Pyraser Brewery in Landkreis Roth. Last year they came along to Oktoberfest at Brentwood Brewery, bringing with them some authentic German bier. When they returned they took with them some Brentwood Beer to share with their colleagues in Germany. Something the town twinning association and the Mayor of Brentwood are hoping for is the blossoming of further future friendships. “My friend Sarah Parish is Deputy District Commissioner for Brentwood Scouts and she’s in the middle of planning a trip to Landkreis Roth in Summer 2021, hoping to take 50 to 100 young people. “I think the Scout’s involvement (Brentwood Scouts is one of my charities this year) would be a good way to introduce young people to Town Twinning via the Scouts,” said the Mayor of Brentwood, Cllr Sheila Murphy.